Hyundai Tucson: Trailer towing / If you decide to pull a trailer? Hyundai Tucson (LM) 2010-2015 Owners Manual / Driving your vehicle / Trailer towing / If you decide to pull a trailer? Consider using a sway control.You can ask a trailer hitch dealer about sway control. Do not do any towing with your vehicle during its first 1,200 miles (2,000 km) in order to allow the engine to properly break in. Failure to heed this caution may result in serious engine or transaxle damage. Always drive your vehicle at a moderate speed (less than 60 mph (100 km/h)) or posted towing speed limit. 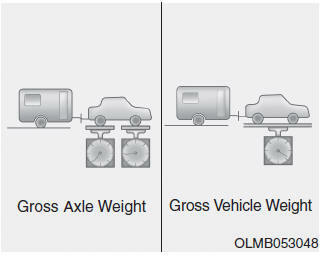 Carefully observe the weight and load limits provided in the following pages. What is the maximum safe weight of a trailer? It should never weigh more than the maximum trailer weight with trailer brakes. But even that can be too heavy. It depends on how you plan to use your trailer. For example, speed, altitude, road grades, outside temperature and how often your vehicle is used to pull a trailer are all important. The ideal trailer weight can also depend on any special equipment that you have on your vehicle. The tongue load is an important weight to measure because it affects the total Gross Vehicle Weight (GVW) of your vehicle. 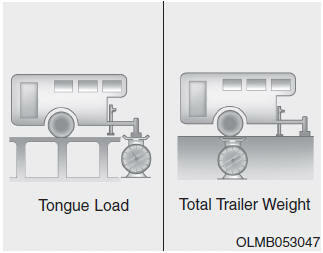 The trailer tongue should weigh a maximum of 10% of the total loaded trailer weight, within the limits of the maximum trailer tongue load permissible. After you've loaded your trailer, weigh the trailer and then the tongue, separately, to see if the weights are proper. If they aren’t, you may be able to correct them simply by moving some items around in the trailer.